This week's challenge on CD Sunday is 'Beautiful Blue'. This is the card I have made for the challenge using Crafter's Companion Popcorn CD, a Martha Stewart punch and some card cand. This is a beautiful card Colleen, I love Popcorn. Super shades of Blue and your MS punch adds a perfect finishing touch along with the Candi. 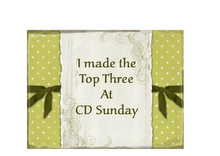 How fabulous, it looks like you have added the stitches, lovely little image and card, thank you for joining us at CD sunday this week Colleen. This is just gorgeous Colleen. Your backing paper and punch look as though they were made for each other.